How do I add more licenses or seats in G Suite? This article details how to add seats to your G Suite for Work service. Be aware that the number of users you can create is limited to the number of user licenses or "seats" you have purchased. If you have reached your limit and need additional users you may always purchase more in the Account Center. 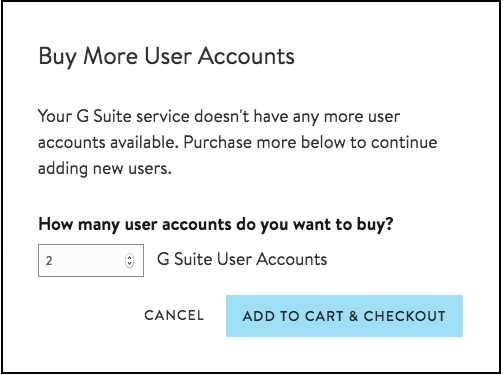 If you already have the seats available to add the number of G Suite for Work users you want, you can skip this process and begin adding users. To create a new user account, you need to have an open license or "seat" available. The instructions below provide details for adding additional seats to your G Suite for Work service. 1. Log in to the Account Center. Scroll down to the G Suite section and click on ADMIN. Make sure you select the domain that you want to work with. 2. 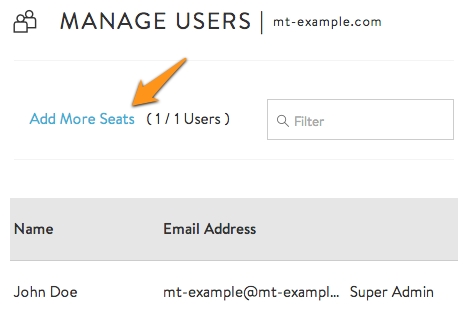 In the Manage Users section, You will see how many you currently have available and in use in the parentheses. Select Add More Seats to continue adding available seats. If you see Add User instead of Add More Seats, you already have seats available to add users and you may begin adding users. 3. To add additional seats simply type how many, in total, that you would like to have available. This includes how many seats you already have. For this example, we already have one seat that is in use and we want to add one additional user. This means that we need to increase the total number of seats available to two and click OK.
4. Confirm the purchase of the additional seat(s). 5. Once you have confirmed the purchase, your additional seat(s) will add to your G Suite service and be available within 30 minutes.